How to construct bar graph on graph paper? 1. Draw a bar graph to represent the following data. In a graph paper, draw two lines OX and OY perpendicular to each other. Ox and OY are the horizontal axis and vertical axis respectively. On OY, put 6 marks at intervals of 1 cm starting from O. Label them 100, 200 and so on. The resulting population Scale will be used to read the population of different villages. Now, on the horizontal axis (OX) make 4 marks at equal intervals. Write the names of the villages, below them. There draw a vertical bar (or line) which reaches up to 600 at the mark for Bear Creek. This bar represents the population of Bear Creek. Similarly, draw vertical bars which reach up to 300, 400 and 100 for the other village. 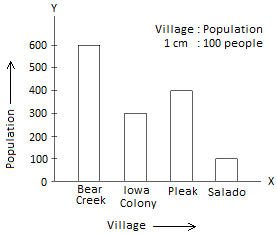 Write ‘Village →’ and ‘Population →’ next to OX and OY, write the little of the graph. You may also mention the scale of the graph. The same bar graph can be drawn using horizontal bars or lines. In this, the population scale is shown on the horizontal axis (OX), as shown below. 2. The weight of four people are recorded by a bar grapg given below. Find their weights. Who is the heaviest and who is the lightest? In this graph, the scale is 1 mm (small division); 1 kg. As the bar corresponding to Mike extends up to 55, his weight is 55 kg. In this way, the weight of the Aaron is 62 kg, that of Ryan 60 kg and that of John is 69 kg. Mike is the lightest while John is the heaviest.